How does searching works in Docurated? : Quark Software Inc.
1. 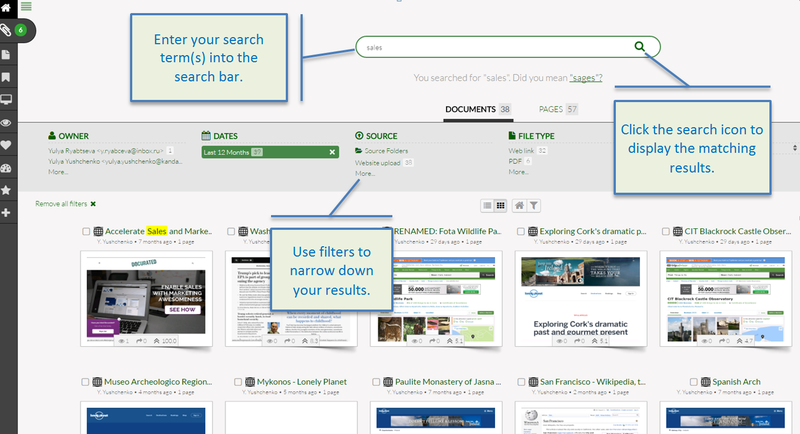 Enter your search terms into the search bar and click the search icon. The more specific your search terms, the better your results. To narrow down your results, put phrases in quotes (“ ”) for exact phrase matching and reduce the number of results returned. To search for files belonging to a particular topic, enter the topic name in the search bar. While typing a search term, the system will suggest the appropriate recent searches, documents, topics, and sources in the drop-down list. OWNER: Filter by the User who first synced the file. DATES: Allows you to place restrictions on the dates searched. This filter applies to a document's modified date. By default, results are filtered by Last 12 months. The "Custom Date Range" function is inclusive. SOURCE: Allows you to place restrictions on the original upload sources searched. Source Folders: Allows you to include and exclude individual subfolders from your desktop, server sync, Google Drive or Box synced content. FILE TYPE: Allows you to place restrictions on the file type searched. TEAMS: Filter for documents your teammates create. TOPICS: Allows you to filter by the Topics you have created, as well as the Topics that have been shared with you. By default, the results are filtered by matching any of the selected Topics, you can change that to only include results contained in the selected union of Topics. 3. 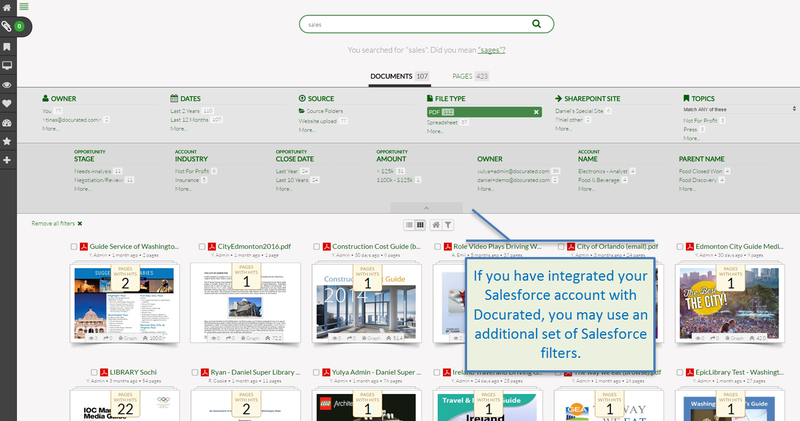 Use Extra Filters: If you have integrated your Salesforce account with Docurated, you will have an additional set of filters which are based on the content Docurated is indexing from Salesforce. To expand the filters, click "Salesforce Filters" under the common Docurated filters. Currently, the following Salesforce Filters are available: Opportunity Stage, Account Industry, Opportunity Close Date, Opportunity Amount, Owner, Account Name, Parent Name.